During the warm summer months we took the opportunity to tidy up Baldwin steam locomotive boilers from Wb 292 and Wb 299. Ron Jones and Hugh McCracken cleaned down the steel work, applied two coats of steel primer and a finishing coat of black enamel. The two boilers were built in New Zealand Railways workshops in the mid-1920s to blueprint y7508, replacing the life-expired original Baldwin boilers dating from 1898. The NZR boilers ran at a higher boiler pressure - 200psi - than the originals, which were rated at a lower 170psi. The 'new' boilers were of similar design to a number other NZR tank locomotives, including Wf, Wg and Ww classes, with many common components and design principles. Ron priming the backhead of 299's boiler on 5 January 2019. By 2 February a coat of black enamel had been applied to most of 299's boiler. To the left are the boilers from steam locomotives Wb 292 and Ab 745. Ron Jones painting firebox top of Wb 299 boiler on 2 February 2019. In the distance the recently completed workshop annex to the rail vehicle shed can be seen. The clean-up and preparation of components of the two locomotives continues. 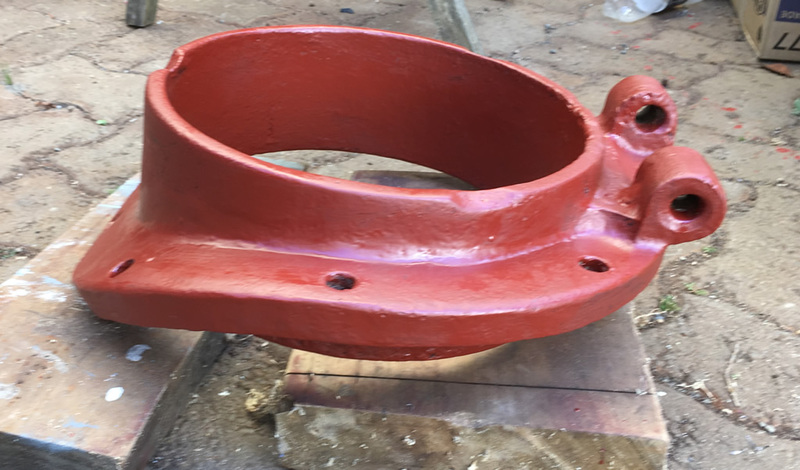 A set of tank filler castings, comprising base and lid, have been cleaned up and painted. A point of interest in the lid - the pattern number #22609 is incorporated in the casting, picked out in white for the photograph. Wb locomotive tank filler base cleaned up, after two coats of primer. Next up with be a couple of finishing coats of black enamel and reassembly. The two complete sets are planned to be put on display alongside the locomotive cab, and eventual fitting to new water tanks. 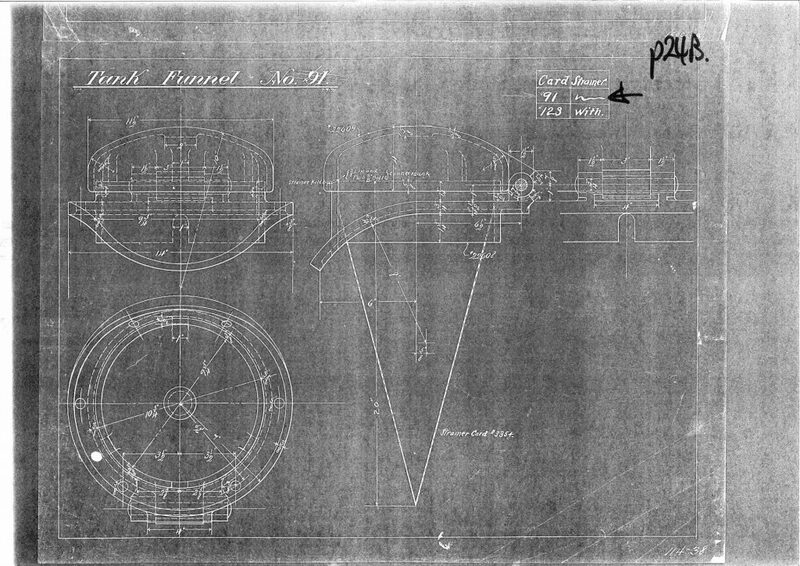 Copy of tank funnel drawing from the book of plans supplied with the Wb class locomotives by Baldwin Locomotive Works. The two castings were each assigned a casting number - the base #22608, and the lid #22609, as seen in the photo of the lid. Another point of interest in the drawing is the card system employed by Baldwin across the range of locomotive components. The drawing was originally assigned card #91 in 1890, but subsequently a variation card #123 added, to specify the inclusion of a water strainer. Drawings for other components often had long lists of cards, covering variations of key dimensions, finishing required and the incorporation of accessories.